Under specific conditions, just about any seaweed, turf alga, phytoplankton or cyanobacteria can bloom and become "problematic." In this book, Julian Sprung focuses on the varieties of algae that commonly do so in aquariums. He identifies them with Latin and common names, photographs of their gross morphology and photographs taken under the microscope that depict important identifying features. 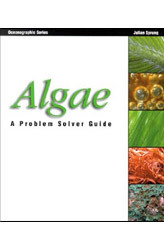 The author gives an extensive set of recommendations for ways to control the growth of each alga through a combination of aquarium husbandry practices and the use of specific herbivores. He identifies algae that become "problematic" in aquariums and explains the physical, chemical and biological requirements of algae.